👨‍💼Hire in Germany? Post your jobs for free. To get customized relocation tips, based on your specific situation, please complete the form below. Are you relocating with a partner? Are you relocating with children? Getting a job in Germany may be a great idea, especially if you are into the tech industry like me. It is not a hard thing to achieve, specifically if you have some experience and a university degree. I have been working in Berlin as a web developer since April 2017, and I will share my experience working here so far. I found some blog posts, articles, and even videos about living in Germany, especially Berlin, but I felt it still lacked some information. I will try to get more deep into the details. Note that this post will mostly be related to working in the IT sector and about my personal experience here. Germany is a great country to live in. It provides a great quality of life, with great social security, educational, and health systems. Also, the German economy is very strong, being nowadays the strongest economy in Europe and the fourth strongest economy in the world. Yet, you may find some differences in public governance here, especially if you are from more liberal countries like the USA (I’m from Brazil). The German government is very serious about social politics, providing quality health care and education, as well as subsidizing public transport, among other things. But, for that, people pay a lot of taxes. Health insurance is collected from your salary, so each person pays a different value, but everybody gets the same health services. This is a solidarity model that is present in every aspect of German politics. I won’t go into details about tax calculations, as you can calculate using this calculator. But one thing to note is that if you are married and your partner does not have income in Germany, you pay less taxes, and if you also have children, you pay even less. Choose the right tax category in the calculator above if you fit into those categories. Also, your health insurance covers your partner and children as well. Among other things, education is free in Germany, even universities. Some university courses are even in English, focusing on foreign students. Another thing to note is that in Germany, and overall in Europe, you will find that social and economic gap is much lower than in other countries. While in Brazil, as a skilled worker in tech, you can get paid 8 to 10 times what a regular blue collar worker is getting paid, in Germany you will probably be earning 2 or 3 times what the regular worker is getting. While everybody is able to sustain a decent lifestyle and the smaller social and economic gap leads to fewer crimes and violence, my purchasing power is actually less than I had in Brazil. Germans living in big cities often live in small apartments (30-50 square meters kitchenettes) and don't have a car, instead rely on public transportation or ride a bike (like me!). Taken that, Germans often value quality of life more than economic success. Companies will not put pressure on your shoulders or give you unachievable goals. If you are staying late, your boss will even ask you why and tell you to go home. Germans believe that work is better done if it’s enjoyable, and I agree! Yet salaries in Germany are often a bit lower than in other countries, like the UK, especially in Berlin (overall salaries in Hamburg, Munich, and Frankfurt are often higher than in Berlin). Still, you will find people all over the world moving to Germany to work. I even have two colleagues from the USA that chose Germany as their new home. The German government and labour policies are very open to foreigners, especially if you are a highly skilled worker. Germans are often known and praised for their efficiency. As I have to agree that mostly things work better here (for example, trains and people are often on time), this efficiency happens as a result of very strict rules and people following this rules strictly. That even means that German rules are even more important than social empathy. Germans are not confortable on bending the rules, as this would imply that their rules don’t work. So instead of applying a work around, the rules should be changed, but that would require following the protocols of rule changing. Even than, sometimes German eficiency fails. We have several delayed constructions, like the Schönefeld airport in Berlin or the Elbphilarmonie in Hamburg (this was finally delivered with a 5 year delay and at 10 times the budgeted costs). So, don’t try to get smart here (take note Brazilians! ), things can get worst for you. But if you follow the rules, everything works just fine. Just be patient and follow all the required protocols. For example, in traffic people are very polite, drivers stop on each red light and respect pedestrians and cyclists very much. But if you try to cross the street in the red light, possibly you will get run over by a car, drivers won’t stop for you in this case. You can get also earn a ticket and get strange looks, especially if there are children around (don’t be a bad example). Every step you make living in Germany is filled with bureaucracy, which you must follow step by step. For everything here, especially public services, you will need to make an appointment. The problem is that you can only get free appointments slots within one month ahead. Also, there are often several forms that you must fill, sign and send the original forms by post. Digitalization is still not very trusted here. That also means that most places don’t accept credit or debit cards, most restaurants and cafes only operate on money. Another interesting thing in Germany is that people often have insurances for everything, as if you mess around you can end up having to pay huge amounts of money. So, get a liability and a residence insurance as soon as you arrive. Most tech jobs and startups in Germany are concentrated in Berlin, but still, you can find tech companies in Hamburg, Munich and Frankfurt, as well as in other smaller cities. So if you are considering a tech job in Germany, most probably you will find one in Berlin. Berlin is the capital and largest city in Germany. There are around 3.5 million people living here. People are living spread all over the city, so you don’t have a large concentration of people and jammed traffic. The city is filled with parks and green areas all over, and there are beautiful canals where you can have a nice walk or even a boat trip. There are cozy cafes all over the city, especially in neighborhoods like Prenzlauer Berg (my favourite! ), Mitte and Schönenberg, and the biergartens are very busy during summer. About Berlin weather, the summertime is great! You actually can get around 25°C temperatures and sunny weather to enjoy a day in the park. You will often find people having barbecues and bare naked sunbathing in parks and lakes during summer. Days lasts for very long, getting dark after 9h30 PM. Summer weather lasts for around 2 to 3 months, then it’s back on being gray, cold and rainy. You will probably get more rain than snow in Berlin. And during winter you will get dark, depressing days, getting dark as early as 4 PM, as opposed to the long days of summer. 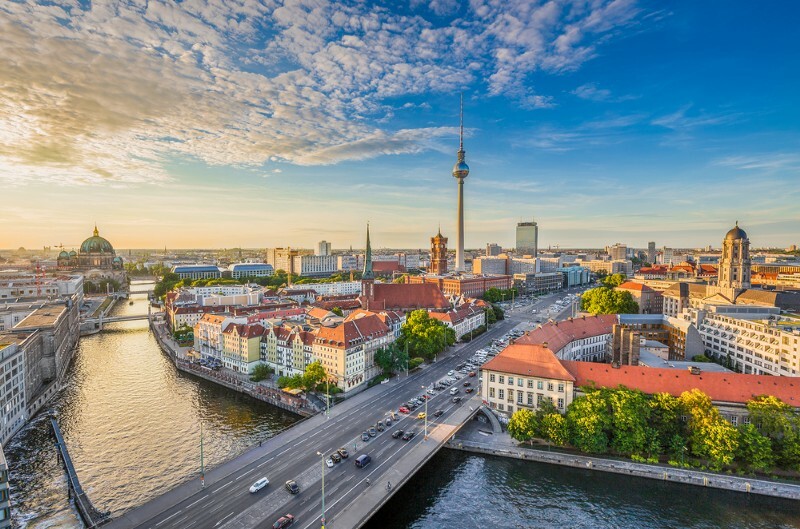 Berlin is one of the most culturally active cities in the world. The city has 175 museums, 140 theaters, 300 cinemas, 4650 restaurants, around 900 bars and 190 night clubs. You will find a show or event on any day of the year, many of them as open-air events in parks. During the 1st of May, there is a massive party and events all over the city, especially in Kreuzberg area, characterized by leftist and social movements and manifestations. It’s a city that you can find anything to do, for any taste, at any time. You can’t ever get bored in Berlin. Yet, Berlin is not a regular European city. You can even hear Germans saying that Berlin is not really Germany. Berlin is truly unique and has its own characteristics, but not everything is for the best. I myself find the city to be very dirty and sometimes even messy. There are a lot of constructions happening in old buildings, blocking the sidewalk, all over the city. The U-Bahn stations are in bad shape, although they work very well. You will find homeless people and often people begging for money inside the U-Bahn trains and stations. Also, Berlin is under constant renovation, with a lot of constructions happening, especially in the Friedrichshain area. Note that the city was divided into two less than 30 years ago and the differences between east (soviet) and west (capitalist) Berlin are still notable. Rent prices in Berlin are rising every day. It is still cheaper than other cities in Europe like London or Paris, and even other German cities like Munich, but the super cheap rent prices days in Berlin are over now. You will be paying around €600-800 monthly for a single room apartment. One thing to note when searching for apartments in Berlin is that they count all rooms, not only bedrooms. So a one-room apartment has only a single room (consider it a living room or bedroom), often with a kitchen inside too. A two-room apartment often has a living room with a kitchen plus a bedroom. There are still some apartments with a separated kitchen. Another thing to note is that most buildings are old, but with a renovated apartment. The city is filled with old buildings with 5 floors at most, without elevators or automatic doors. Rarely there are new buildings, that count with elevators, mostly in Mitte, Litchenberg or Friedrichshain, but are overall more expensive. And you won’t find buildings with a doorman, which is very common in Brazil. Also, if you are planning on owning a car, note that old buildings do not count with a garage, so you will have to rent a parking space on the street. Even new buildings with a garage, the parking space is rented separately, which costs around €60 -90. Finding an apartment in Berlin is also becoming harder every day. You will have a lot of competition, it looks like getting a job. Often when visiting an apartment for rent, you will find 10–20 other people also visiting at the same time. I heard stories of lines with over 100 people to visit an apartment. You will have to provide work contracts, proof of income, and documents proving that you don’t have any unpaid debts (the so-called SCHUFA). That’s why so many people often share apartments or rent rooms in other people apartments. This is possibly the best option you get when arriving, but note that these room rentals are often temporary, sometimes even less than a month. Overall Berlin is a great city to live, but it has it’s problems too. It is an always changing city, culturally active, filled with green areas and much fun. 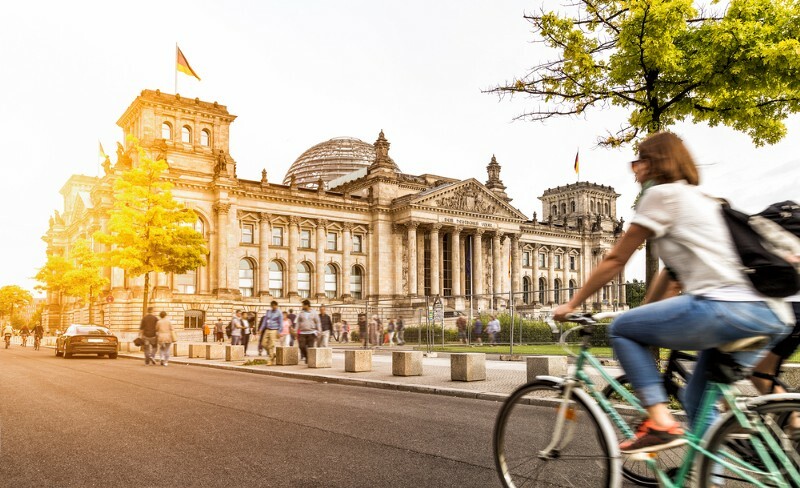 It is a big city, with a lot of people, and if you are seeking a calmer and more settled atmosphere, maybe you won’t find it here in Berlin. Finally, the city has a lot of immigrants and welcomes expats, with a lot of people speaking English at most any restaurant or shop. This was my personal experience on working in Berlin so far. Many of my opinions reflect my personal taste and feeling about Germany and Berlin. If you want to know more details about my personal experience or any tips on how to get a job here, please connect with me on LinkedIn or Xing and send me a message there! I will be more than happy to help you out! Note: I wrote another post on how you can find a tech job in Europe and especially Berlin. If you think Berlin is for you I recommend you check it out! More stories are coming soon! A minimum base salary for relocation starts at € 40000 per year, while more leading roles (architects, team leads) can bring you gross annual income of € 75000, without bonuses. *The figures are imprecise and reflect the approximate salary range in this country. Keep in mind that the salaries you’re offered when relocating may differ from those you can get already living in the country. Berlin, as a world city of science, media, and politics, is the capital and the largest city in Germany. This city is well-known for its amazing festivals, exciting nightlife and a high quality of living. In Berlin the main language is German, but you are able to find a lot of people under 40 who speak English. Furthermore, the longest open-air gallery in the world is situated in Berlin (1.3 kilometer section of the Berlin Wall). Moreover, Berlin is famous for the tallest tower in Germany — TV tower near Alexanderplatz. Munich is a beautiful city, which is situated in Germany. Munich is number 4 in worldwide list of cities with high living standards according to the Mercer Quality of Living Survey. This city is very prosperous because Munich has the lowest unemployment rate in Germany. Furthermore, this city is famous for its remarkable and splendid architecture and annual Oktoberfest beer celebration. Moreover, there is one more interesting fact that Munich is a home to the BMW and has a large museum, which is dedicated to the BMW. Frankfurt, as a business and financial center of Germany, was ranked 11th at the Global Financial Centres Index in 2017. Moreover, Frankfurt is the most international city with the highest percentage of foreigners in this country. Here you can meet people who speak your language and restaurants that serve your traditional food. Frankfurt is famous for the Frankfurt School and Goethe. Furthermore, here you can find the busiest German airport, which is the third-largest in Europe. Some people call Frankfurt a city of contrasts because in this city modern skyscrapers coexist with old buildings. 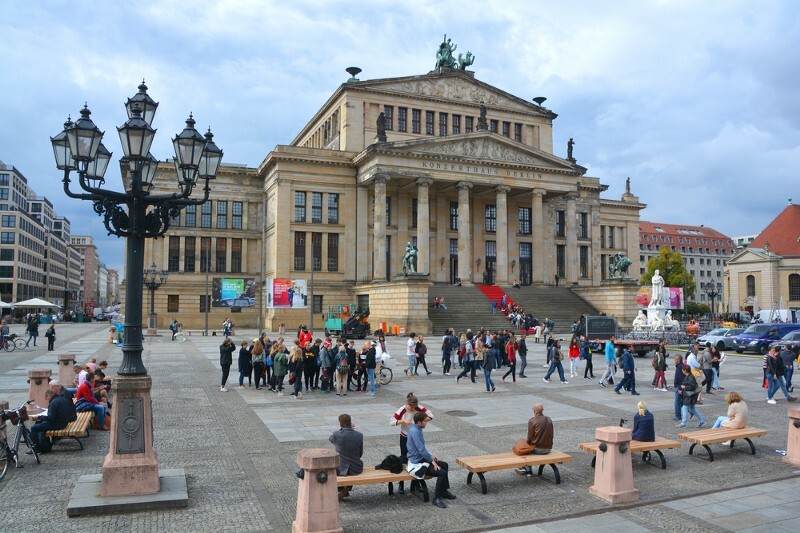 In addition, Frankfurt is well-known for its museums, theaters, and opera.